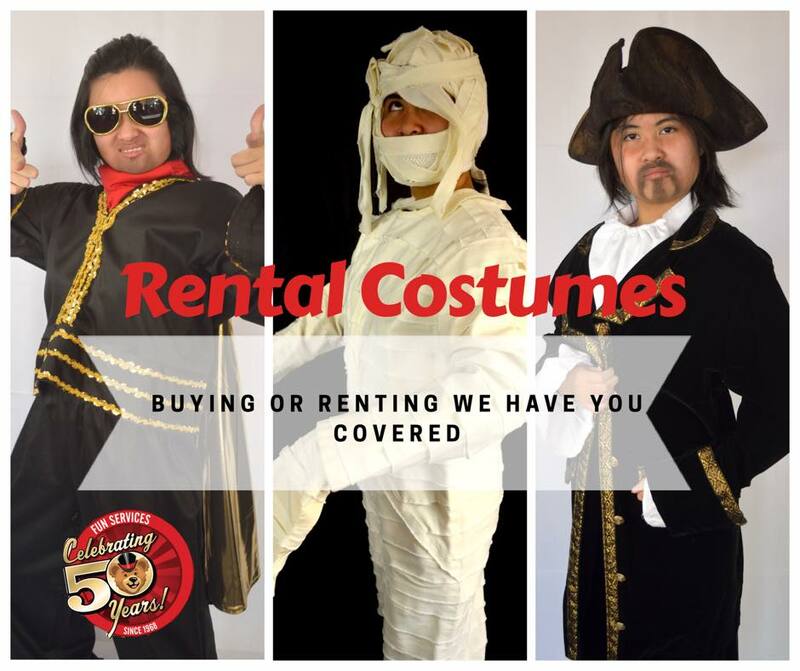 Click Here for a PDF list of our Rental Costumes only. The file lists the name of the costume, the size(s) offered, the per day rental fee, and the required security deposit. Click here for a PDF version of our Book of Rental Costumes. This is a digital version of the rental book we keep in the costume room at our store. The pictures are (mostly) in alphabetical order to correspond with the price list. Many of the costumes do not have pictures, but we’ve included what we have. 1. All rentals require a deposit, absolutely no exceptions. An imprint of any major credit card is preferred. Cash deposits are accepted as well. 2. Rentals must be tried on in store, prior to reservation. Since all sales are final, we do not rent costumes to new customers over the phone to avoid any dissatisfaction that could have been prevented. 3. Rental rates are per day basis. Pick up on the planned day of use, then return it the next. Additional rental time is to be requested at the time of payment, or be charged on a “full rental price per day” basis. 6. CANCELLATION POLICY: Failure to notify Fun Services within 24 hours of your reserved pickup time will result in a 10% charge per costume as a cancellation fee. 7. There will be no refunds given on any rental once it leaves our building. 8. All costumes must be returned by designated time on contract or be charged FULL-DAY RENTAL, PER COSTUME, PER ADDITIONAL DAY OUT.. Discounted daily rates only apply if negotiated beforehand. 9. The deposit is taken to insure the return of the costume in its entirety and undamaged state. If the costume is found to be damaged (cigarette burns, rips or tears, stains, etc.) and needs to be replaced or repaired, your deposit will be used to do this! 10. All rentals are adult sized. We do not have child size costumes for rent although some children may fit our adult sizes.